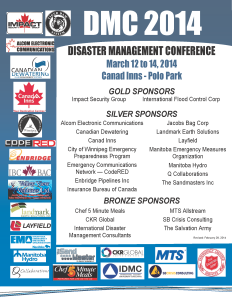 Impact Security Group is again honored to sponsor the Disaster Management Conference at Canad Inns Polo Park. This year speakers such as Tony Beliz, Deputy Director, Los Angeles Department of Mental Health, Emergency Outreach Bureau, Shane Schreiber, Chief of Staff of Alberta’s Flood Recovery Task Force, and many more. These conferences are important in the development of our emergency preparedness as we had seen first hand what a disaster can do to your community during the widespread natural disaster.